The Irreplaceable Supplier in Filling, Capping, Labeling and Cartoning markets. 1. This machine is applicable to packing of cosmetics, drugs, foods. 2. This machine is easy for operation with its speed for stepless adjustment upon easy change of carton. 3. Single transmission with mechanical cam interaction is adopted thus making the machine to attain to the performance of high precision, durability and operation in high speed. 4. 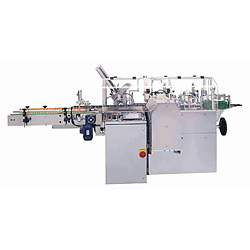 With diversified optional attachments, this machine can be used for packing the products in sheet form, heat glue-melting machine, leaflet insert and embossing device to meet the packing requirement. (1) If the leaflet is not input, defective products will be ejected. (2) If product is not loaded in, defective products will be ejected. (3) If carton is not input, products cannot be loaded in. (4) If the guard cover is not closed, machine will be shutdown automatically. 1. Model: CJ-120 Automatic cartoning machine. 2. Production speed: 20-120 per/min. 3. Power source: 220V; 50/60HZ, single phase. 4. Motor HP: 2HP-4P motor & reducer. 5. Compressed air consumption: 90L/min. 6. Machine dimension: A: 3183L x 1416W x 1510H mm. (1) B: 3183L x 2046W x 1510H mm. (2) C: 4780L x 2046W x 2080H mm. 7. Air press (self-provided): 5-6kg/cm2. 8. Machine weight: A, B: 1250Kg & C: 1350Kg.